The next oldest in my new collection is a Graflex RB series B camera and the first with some personal history. The company changed names a number of times over its history, making it easier to narrow down the age. The manufacture's plate indicates it was made by The Folmer-Graflex Corporation. According to Wikipedia, this was used between 1928 and 1946. Near as I can find in searching around, the RB series B was made until 1942, further limiting the possible date of manufacture. This one has a number of interesting features to it. The back film carrier rotates, allowing the photographer to switch between portrait and landscape without rotating the camera. Normally there is a sheet film holder on the back. Mine has a "newer" 120 holder that clips into where the sheet holder would usually fit. The lens is interchangeable and had several options. I just have the standard lens made by Kodak. It has f/stops from 4.5 to 32. There was also a telephoto lens that was popular with portrait photographers. The shutter is a length of fabric with various sized slits in it called curtain apertures. It is rolled onto a roller that has spring tension on it. The more it's rolled, the higher the tension and the faster the shutter speed. The combination of which aperture is selected and the amount of tension on the roller control the shutter speed from 1/10th to 1/1000th of a second. 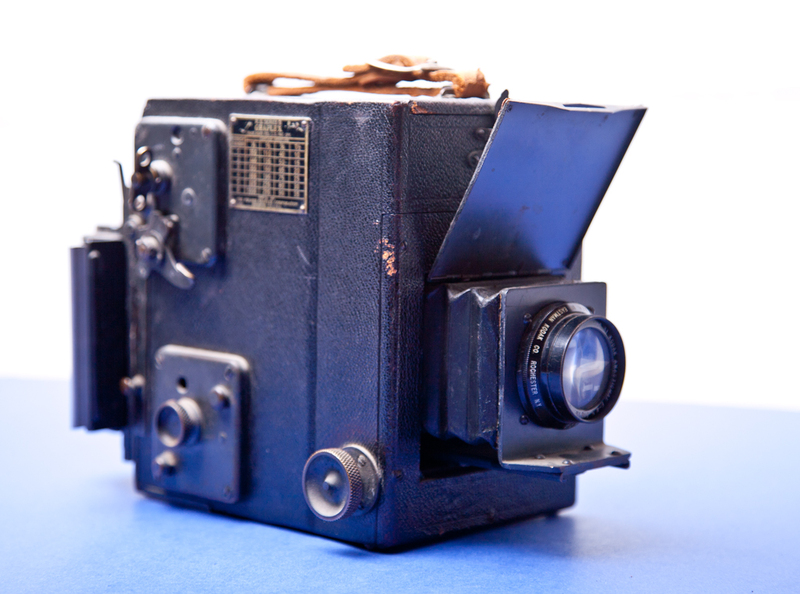 The viewfinder is setup like a twin-lens reflex with a 45 degree mirror and a ground glass. The difference is there's only one lens. The image on the glass is size-for-size exactly what the film will see. It's a real SLR. As I mentioned, there's a bit of personal history with this one. It had belonged to my great-Grandfather and my Grandparents didn't have any use for it, or one of the other cameras, so they gave them to my Dad when I was an infant. I have early memories of playing around with this but I've never known it to be used. I don't know that my Dad ever put any film in it. I think it's time to get some 120 and see what it'll do.